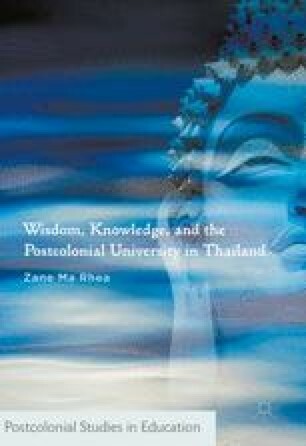 This opening chapter introduces the argument for thinking about, theorising and operationalising wisdom as a guiding concept for examining the role of Thai universities in globalised knowledge transfers and exchanges. It first provides some background to the research underpinning the ideas in this book, outlining the methodological approach used for the research that underpins this work. It then discusses the Thai-Buddhist approach to the cultivation of wisdom, and in parallel, the engagement of the Kingdom of Thailand in its bringing of modern knowledge and capitalist economic practices into Thailand, and its efforts to find balance between the old and the new. An earlier version of this chapter was published as Ma Rhea, Z. and Teasdale, G.R. (2000) “A Dialogue between the Global and the Local” in G.R. Teasdale and Z. Ma Rhea (Eds). 2000. Local Knowledge and Wisdom in Higher Education. UK, USA: Pergamon Elsevier, 1–14. Pew, Research Centre. 2010. “Global Religious Landscape 2010 – religious composition by country.” http://www.pewforum.org/files/2012/12/globalReligion-tables.pdf.